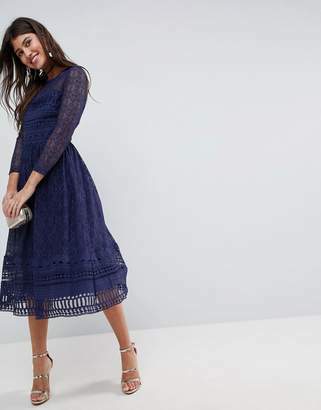 Midi dress by ASOS Collection, Fully lined, Plunge neck, Take a dive, Cinched waist, Strappy back, Back vent, Midi length, Regular fit - true to size. Score a wardrobe win no matter the dress code with our ASOS Collection. From polished prom to the after party, our London-based design team scour the globe to nail your new-season fashion goals with need-right-now dresses, outerwear, shoes and denim in the coolest shapes and fits.